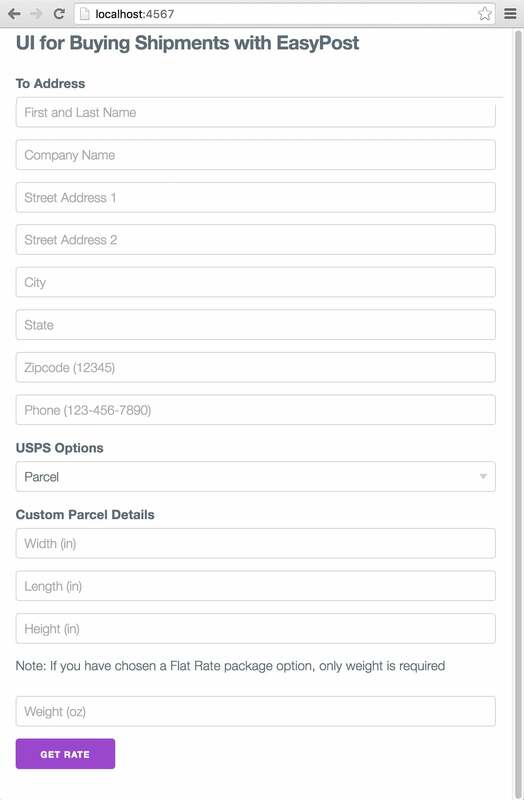 In this tutorial, we will create a sample web application to buy shipments, create labels, and verify addresses using the EasyPost API. We'll be using Ruby, Sinatra, and the EasyPost Client Gem in this example application, but this functionality could be integrated into any app written with Python, PHP, Java and other languages supported by the many EasyPost official client libraries. Make sure you have Ruby and Bundler installed. Make an Address to use as your from_address, and save its ID (adr_xxxx). For the purpose of this tutorial, we assume that the website is for an e-commerce business. The from_address represents the company's shipping location and will not change. Hence, we need to generate an Address separately, and store its ID. You can do so using the client libraries, or using curl on the command line. Check out our Getting Started guide if this is something you haven't done before. The first thing we need is an API key from EasyPost. This is an example application, so we are going to use the test API key, but be aware that non-test data will still be visible. You can find the test key on the API Keys Page. We will start out by creating a file named Gemfile to describe gem dependencies for our Ruby code. A gem is a Ruby package that will install the libraries that we need. Your Gemfile should always be in the root of your project directory, as this is where Bundler, the Ruby dependency manager, expects it to be. Install the Gemfile-defined dependencies by running bundle install from your project root in the terminal. require: require statements import the dependencies that Bundler installed for us. Go ahead and visit http://localhost:4567/ and you should see the text "Hello world" on the page. You can stop the application with Ctrl-C. In the next step, we will create a view that displays a form to create a shipment, rendered by the '/' route. Considering that there are many fields for each of the above objects, we can create partial views to enable abstracting and reusing certain portions of the form. We can abstract the address input fields into a partial by creating a file inside the views folder named _address.erb . Now we'll hook up the '/' route to our erb view in app.rb. Replace the "Hello World" string in get '/' with erb :index. This renders the index view we just created. Visiting / in your browser should look like the below screenshot. Our example repo may have some slightly different css styles, but the HTML and functionality should be the same. We have a form set up at this point. But, in order to get rates, we need to create a shipment when the form is submitted. Let's create a POST route adjacent to our GET route that handles our form submission. # repository or the Errors guide for examples. If you'll ship to the same address more than once, consider storing the Address ID for to_address using the same principle that we used for our from_address (we recommend leveraging your database in this scenario). This will cut down on response times. Now that we have a shipment object, we can provide the users with rates to buy the shipment. So let's create a route that retrieves the shipment and renders a page that lists the rates. We still haven't created a rate.erb view. To do so, create a rate.erb file inside /views that will display the rates. This code performs a simple iteration over our shipment’s rates array and displays it as a table. The user can choose a rate to buy the shipment. Verifying an Address before you ship is a great way to reduce issues with delivery. An invalid address may not return correct rates upon creation of shipment. In order to set up address verifications, there are couple of small additions to the above code. Add our verification options to the address hash with the validation types we would like performed. So let's go ahead and set up address verification. Add the following to the last line of the address partial, and replace your current post '/shipment' route with the code below. to_address = if params[:verify] == "true"
In the above example we have used the verify_strict verification parameter. EasyPost also provides the option of a verify parameter. Using the verify_strict parameter will raise an EasyPost::Error on address verification failures and will not create the address object. verify always creates the address object with a verification hash containing errors/warnings even if verification fails. The zip4 verification performs CASS Validation and delivery verification checks that the address is deliverable. delivery verification may adjust an address or complete a 9 digit zip code based on the USPS address database. For your customers, we suggest that you display the corrected address back to the user and allow them to approve the verified address. In order to create the label view, add another file in the views folder and name it shipment.erb. Add the following to the label view. Yep, that’s it! That’s all the code you need to create and buy shipments. Let's demonstrate all the functionality that we have added. Let’s run our application! As before, run bundle exec ruby app.rb from the project root, and you should see your application start up. Then just visit http://localhost:4567 to see it in action! We simplified things for the purpose of the tutorial, but you can view a more complete example in the repository on GitHub. The sample repo also demonstrates some basic error handling, and would serve as a great starting point to keep building off of!